When an application is no longer used or is being decommissioned, the data held within the application needs to be archived to a repository where it can be kept safely until being purged at the end of its lifecycle. Archived data can still be retrieved when needed, unlike long-term data storage, and also keeps your sensitive data secure from threats, where it might otherwise be vulnerable in an out-of-use app. 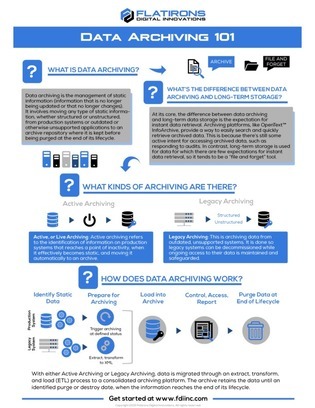 Learn more about archiving data in this infographic, including how the process changes for legacy and production systems. Also find out which steps you need to take immediately to protect your static data.